I’m a magpie. When I see a discarded object that looks interesting I bring it home. 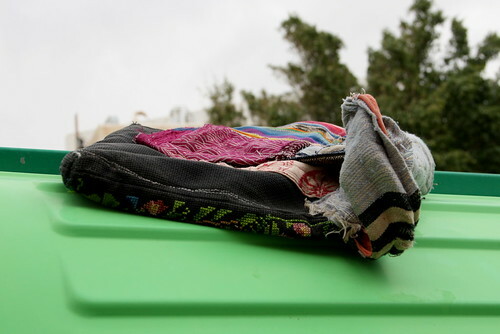 This bag, left on top of a garbage bin, caught my eye while I was on my way to work (in my neighbourhood it’s very common to leave things that others might want, like outgrown children’s clothing or old towels, in a bag on top of the bin for others to take). I photographed it because it was obviously handmade and heavily patched. When I noticed that there was a bit of Arab embroidery on one panel, I stuck it in a plastic bag and put it in my backpack. My husband was really grossed out by my bringing it home but the bag wasn’t smelly or terribly dirty. It was a bit damp from the previous night’s rain. 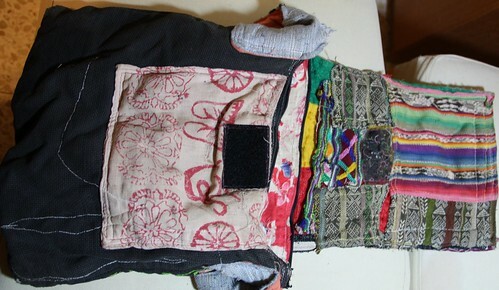 Here’s a photo of the bag spread out, with all the patches and home-made strap exposed. The bag evidently began life as a cushion cover. 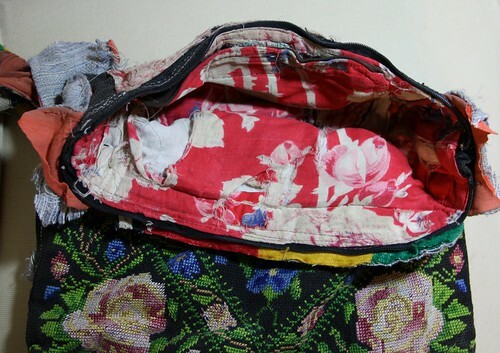 In the next photo you can see that a clever recycler used the zipper of the cushion cover as the bag’s closure. 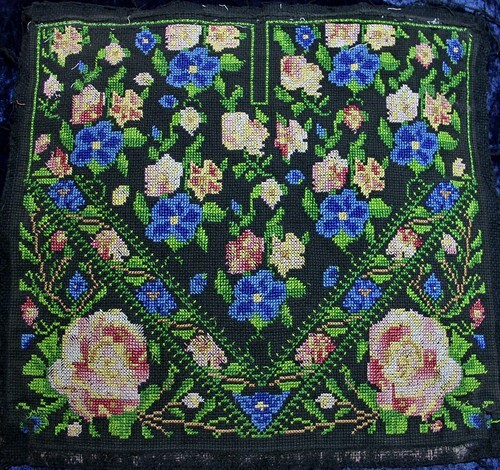 The back and front of the bag were made from the same cheap, black Aida cloth typically used for tourist-shop embroidery. A red, flowered print lining had been inserted. Taking the bag apart was a lot harder than I imagined because the lining and straps had been machine-sewn with heavy-duty thread and close stitches. It required quite a lot of cutting with a seam ripper to dismantle the strap and lining. Taking the cushion cover apart was even harder because the fabric and thread and zipper were black and the cushion cover was lined with a lining that had started to adhere to the stitches. At this point, the dismantling process became a lot dirtier. 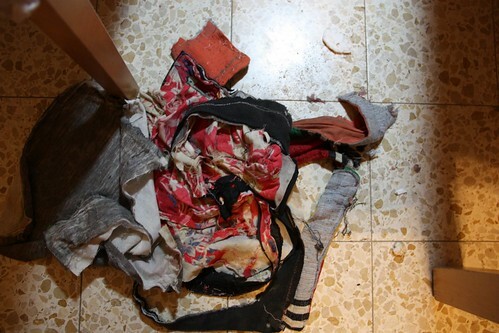 The bag itself was fairly clean, but years of use as a cushion cover had allowed particles of dust and dirt to seep through the threads of the black fabric and to be trapped between the liner and fabric. I put a towel over my laps to protect my clothes and the chair I was sitting on because so much gunk was flying around. At the end of the process I had a pile of rags and dirt on the floor, along with well-laundered tissues and bits of thread. The grey and white rags on the left are the original lining of the cushion cover. Here’s the back of the embroidery. There was a little damage in one corner where part of the design had been caught in a corner gusset. 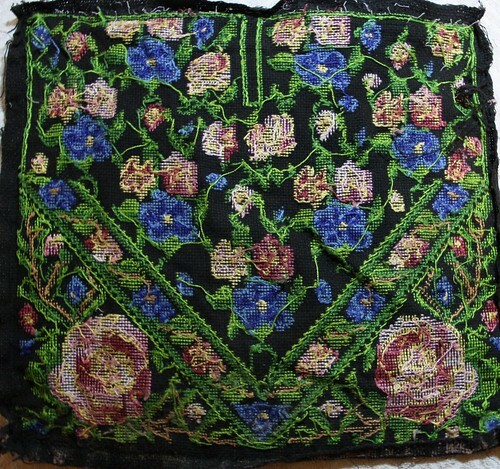 Otherwise, the embroidery was intact and in fairly good shape, although faded. The photo at the top shows the embroidery panel after I washed and left it to dry. It’s typical tourist-shop embroidery, nothing special. The shape is meant to mimic the bodice of a traditional Bedouin dress but this piece was not a recycled dress panel. The fabric is too flimsy, the piece is too small, and the fabric was an exact match with the back of the cushion cover. The thread is cotton, probably perle 8. It’s not of sufficiently high quality to frame (like the old mola that I found sewn into a bag at a craft show), but I’ll find a use for it. Update (Mar. 28, 2011): Someone requested that I post the measurements. I totally forgot! It’s 31 x 29 cm (11 inches high x 12 inches wide). This entry was posted on March 28, 2011 at 10:38 am	and is filed under Crafts, photography. Tagged: cross-stitch, embroidery, recycling. You can follow any responses to this entry through the RSS 2.0 feed. You can leave a response, or trackback from your own site. It is a cool find! One never knows until it is destructed to see what is really there. What about making into the cover for a small paperback? Or made into a small bag for… something? This would be nice copied in beadpoint, maybe? Anyway, lovely find.